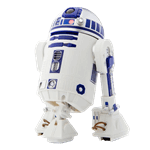 The specialized tech in the Sphero Star Wars' R2-D2 is unlike any other, making it as authentic as the trusty Artoo you've come to know and love. R2-D2 has 4 motors - two for its dome and shoulders, and one in each foot, allowing you to drive Artoo, go from bipod to tripod stances, or trigger emotive waddles. Artoo's signature front and rear lights are fully functional. Multi-color LED's control the front and rear lights, white LED's light up the front and rear logic displays, and a white LED controls the front holographic projector. R2-D2 will react to your presence as well as other droids thanks to its sensors. The beeps and boops come right from R2-D2 itself. Begin a new AR adventure alongside your Sphero BB-8 or BB-9E droid in the trainer, open the Sphero App-Enabled Droids app, and see the product come to life within the app in this new experience. Don't worry, R2-D2 doesn't miss out on the experience. This astromech droid's body acts as its own fiducial mark to start your AR journey simply with the app. Roam iconic ship interiors and memorable locations from the Star Wars saga, and more. Each droid has different holographic environments to enjoy. As an added bonus, BB-9E gets to roll through a new First Order Star Destroyer from Star Wars: The Last Jedi. Watch your droids interact together and view films from the Star Wars saga with BB-8, BB-9E, and R2-D2 reacting by your side.